Feb 14, 2013, 03:05 am Last Edit: Feb 10, 2016, 03:45 am by Nick Gammon Reason: Mentioned problem with seeing images. Note: If you don't see any images in this post you may be blocking cross-site images (eg. with Privacy Badger). The images are hosted at a different site. Allow the domain gammon.com.au if this happens to you. Create an account (if necessary), and login (sign in). The above example gave lots of hits. Read some of them, perhaps your question has already been answered. If that doesn't help, try browsing existing threads in the forum for a while. Maybe what you are asking is currently under discussion in another thread. Click the button shown: "New Topic"
Try to summarize your problem with a helpful and informative subject line. Helpful subjects draw in people who might know the answer. Unhelpful ones are likely to be skipped. In particular avoid subject lines in ALL CAPITALS. That annoys a lot of people, they feel as if you are shouting at them. 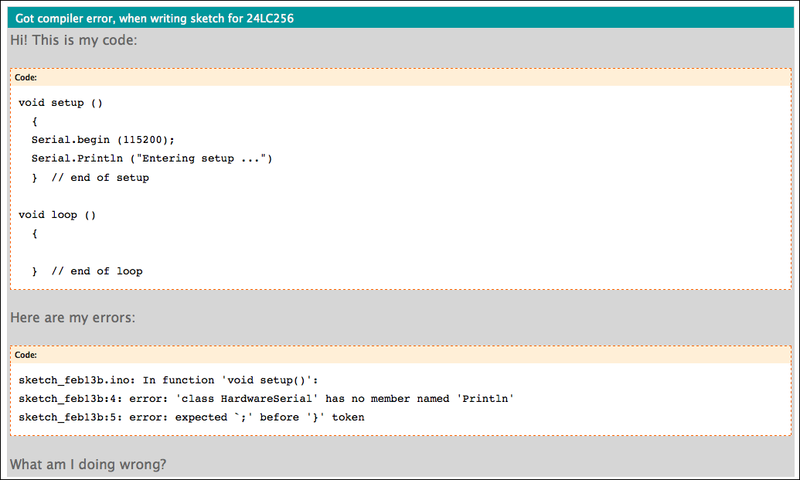 (In that example I highlighted both the code - and clicked the "</>" button - and then the error message - and clicked the button again). Then you can browse your hard disk for the image, code, schematic, photo, that you want to attach. Please resize photos down to a reasonable size. A 4 megabyte photo takes a long time to download. As a courtesy to other forum users, images should be no more than a couple of hundred K bytes. This is a forum you are using, not a mobile phone. Start with a capital letter. Hi! Can you please help me with my code? I attach a copy below. Code pasted here inside code tags. Errors pasted here inside code tags. Taking the time to make a proper, punctuated, post is a mark of courtesy and respect. It will improve your chance of a response. Mention which Arduino you have. Is it a Uno? Leonardo? Due? Mini? Mega? The problem might be specific to a certain model. Post a complete sketch (program code)! If you don't you waste time while people ask you to do that. However, with coding problems, if possible post a "minimal" sketch that demonstrates the problem - not hundreds of lines of code. If the problem goes away in the minimal sketch, it wasn't where you thought it was. Copy and paste code. Don't retype "from memory" on your mobile phone, in the train. 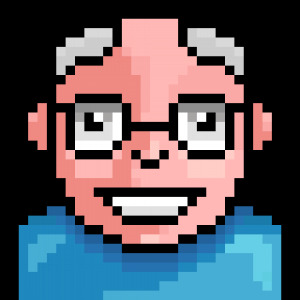 If you are using a library that does not come with the IDE (in other words, you downloaded it from somewhere) please post a link to this library. 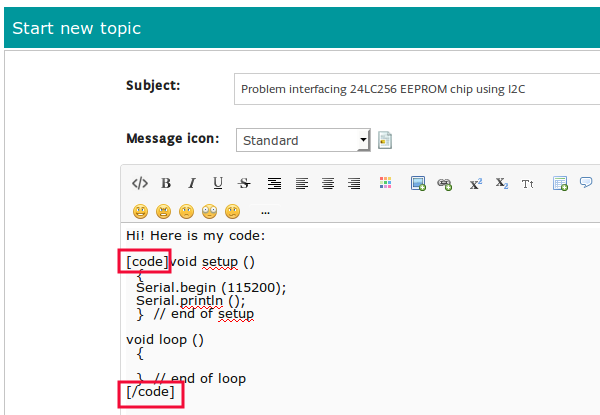 Try to narrow down the problem, whether coding or electronic. Don't confuse us and yourself by trying to do everything at once. For example, if you are having problems reading a sensor, make up a simple test case, that tests that sensor (both electrically and in code). Put your location (country) in your forum profile. That allows answers to better help you with mains voltages, local suppliers, and other local issues. How to use this forum - continued. Feb 14, 2013, 03:06 am Last Edit: Apr 25, 2015, 04:55 am by Nick Gammon Reason: Added note about not changing threads to a dot. The messages part of the forum is for personal messages. Not technical questions. It is not appropriate to find someone who you think might be able to help, and try to get one-on-one personal assistance. If you do, I suggest you be prepared to pay for such personal help. If you are really keen to get the attention of what appears to you to be an expert in your problem, post a forum question first (as described above). Then wait a day or two. That person may be busy. If they haven't answered by then, and if no-one else has been able to help you, you could send a brief message politely asking for assistance, including the URL (link) of the forum thread. If you don't post a link to the forum question, the person you are asking for help has to try to work out where it is, and the time and effort involved may slow down, or stop, their response. 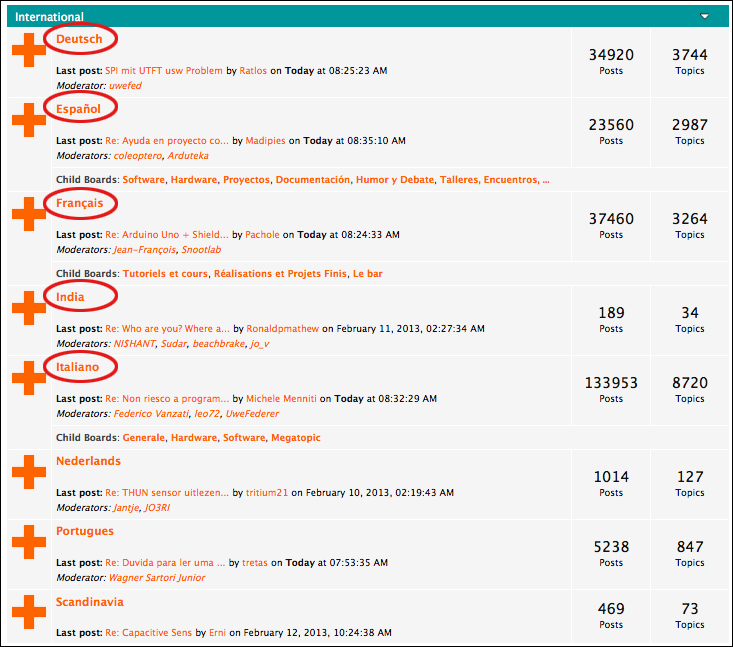 Note that generally questions posted on the forum are answered within the hour, by someone or other. Asking a particular person to help may cause at least an 8-hour delay, if they happen to be asleep, at work, out fishing or whatever they are doing. We know you are anxious to get an answer to your problem, but re-posting the same question to multiple parts of the forum causes duplicate effort, and divides the focus on your problem. You'll get a better answer if everyone can discuss it in one place. Cross-posting is very annoying; the moderators will delete your extra posts, and you will get a warning. Save all the hassle, and just post the question once. It will be noticed. 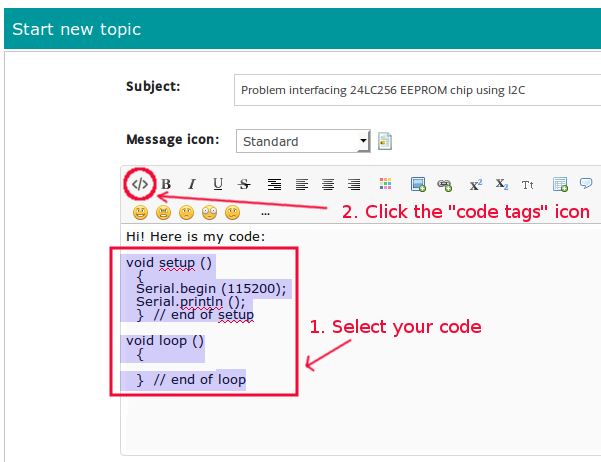 If you aren't sure what section to post in (Programming Questions, Electronics, etc.) make a guess. Don't cross post "just in case". Don't bump your thread after an hour. Because of the different time-zones the person who knows the answer may be asleep, or away for the day. Maybe after a couple of days. If your question didn't get an answer, honestly review it to see if you posted enough information to help people answer you. Did you even ask a question? If someone asks for more details, they are probably trying to visualize what you are attempting to do. Don't fob them off with "that's irrelevant" sort of responses. The more detail about your project, the better the help you will get. A signature should be preferably one line, and relevant. A signature that links to some unrelated-looking site (like football competitions) is likely to get you banned as a spammer. To keep bandwidth down, no images, thanks. A little courtesy and politeness goes a long way. Even if you think a question has been asked before, or you don't see the point of it, try to answer politely. Remember a lot of the posters with high post counts see the same questions every day, and they may get a bit terse if you appear not to have tried very hard to help yourself in the first place. You will find that if you respond in a friendly way, people will stick with you and you will almost certainly get your problem solved. Personal insults are not acceptable. Stick to the topic. You will probably quickly get some helpful suggestions. Read them carefully. If a reply mentions something you don't understand (eg. 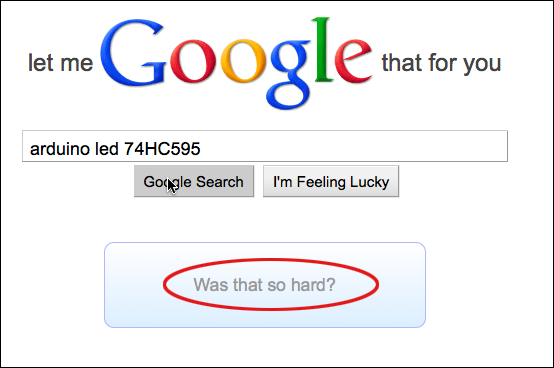 "shift register") try to find out for yourself what that means, by using Google. If you don't understand part of a reply, say so. Say which part. Don't just ignore it. Apply suggested fixes, even if they don't seem relevant to you. Seemingly insignificant changes might actually solve your problem. Look for hints about what is wanted. For example: "what code?" means: "Please post your code." If you make changes, and things still don't work, post the changed code (or wiring) as appropriate (in a new reply). Answer questions. It is frustrating to have to take three pages of a thread to drag out of someone what code they are using, or what their wiring is. Except for adding code tags, please don't modify earlier posts to make corrections. That makes the following posts read strangely. Post the modified code in a new reply. Once you have solved your problem, do not delete the thread! 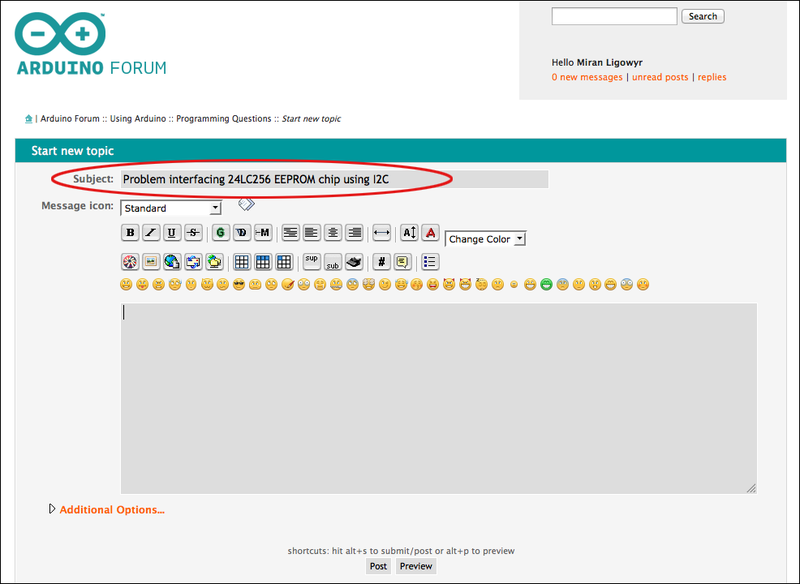 The forum is supposed to be a knowledge-base. Deleting a thread once you are happy does not help future people with similar problems. Nor should you replace your original post with something meaningless like a dot. Similarly, if you have worked the problem out, as a courtesy to other people reading the thread later, explain what you changed that made it work (eg. 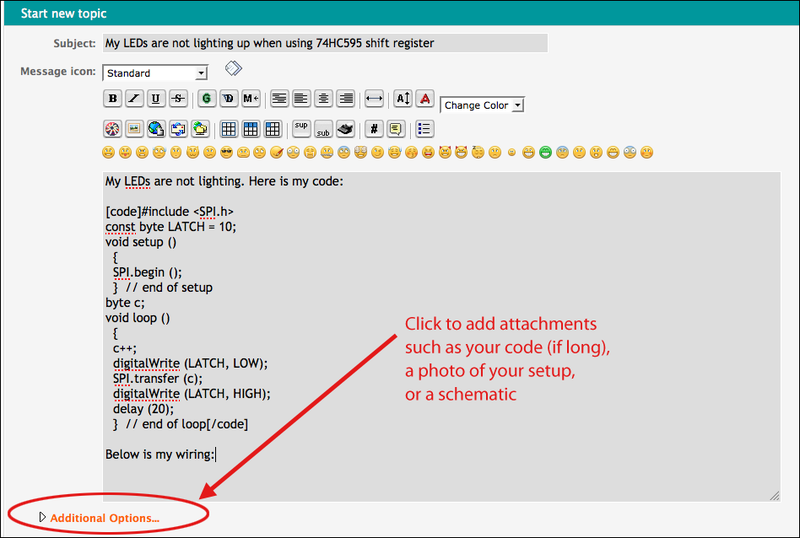 post the corrected circuit, or corrected code). If you consider the issue solved, please edit your original post (the first one in the thread) and add "[solved]" to the subject line. That helps people know the issue is resolved. Also please post the solution, whether you worked it out yourself, or if someone else helped you. A note that "this was solved by doing X" is very helpful to other people with the same problem. Thanks! Re: How to use this forum - please read. Feb 14, 2013, 03:29 am Last Edit: Mar 19, 2016, 10:02 pm by Nick Gammon Reason: Added X-Y problem to the tips. 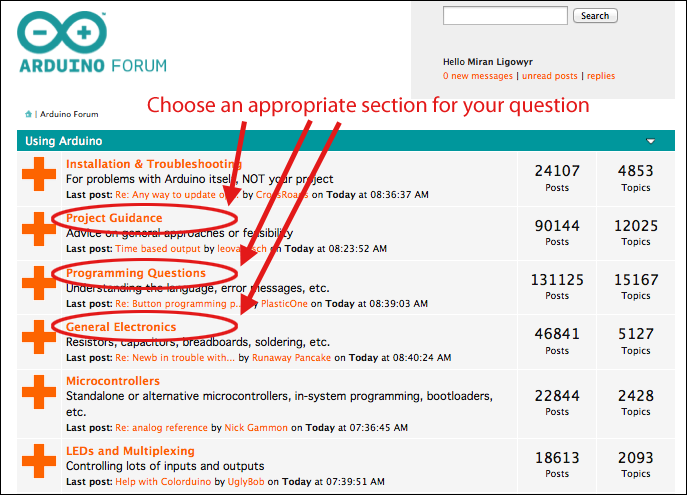 If you want to receive good answers to your questions in the Arduino forums - be sure to provide us with your complete source code, your schematic and/or hookup diagram (we much prefer a schematic if you have one), as well as clear pictures relating to your project (ie - with a schematic and a clear picture of your breadboard, we can easily spot bad connections, for instance). Don't give us links to another website showing someone else's implementation (pictures, schematics or code) - we need to see your implementation. I cannot tell you how many times questions have gone round and round with people seeking help, only to find out that they had made a wiring mistake, which we could have spotted fairly quickly had they originally provided us with pictures, etc of their project. Post your complete code (and use the code tags! ); if your code is too large to put in a single post, then provide a link to a github or similar shared area. Sometimes we can diagnose an issue with just a snippet of code, but more often than not, the complete code will reveal to us problems that can't be found with just a snippet. If you can't post the complete code, schematics, or other parts of your project (due to any number of issues), then you may find that we won't be of much help. Also - don't expect answers immediately - don't sit there waiting, "bumping" the thread every 15 minutes or so; more likely than not, that will just turn off people from helping you. Instead, use your waiting time to think about your problem, and other ways to potentially find the problems or fix it. In other words, be productive with your time waiting - you might just fix it before anyone else does! Be sure to update the thread if you try new things and get results that seem promising (or that fail as well). Most of the time you may have to wait a while, simply because people are trying to look at the problem, understand the issues, and figure out a solution. Some of them (depending on the problem of course) may be trying to replicate your project, to see if they can get the same failures to occur, and how to fix them. When someone gives you advice, try it out. Don't just sit there and contradict them, or tell them "no that can't be it" - unless you have a really good reason why that would be (and provided you gave us a proper description and such about your project, and asked the questions properly - then you should have addressed those reasons anyhow from the beginning). Nothing is more frustrating than someone asking for help only for them to turn around being contrary after you have given them help. Also - don't claim you are an engineer or some other high-falutin' title, and then go and ask questions that make us wonder what box of cracker jacks you got your degree from. We can see through that a mile away; we also don't like doing other people's homework for them, and we see those kinds of questions often as well at certain periodic moments (on this and other electronics forums we are on - we all have seen it, we know when the waves are about to start with people asking for homework help - we don't mind honest questions toward understanding, but we don't like being conned into doing someone's homework). This section courtesy of forum user cr0sh. We see a lot of X-Y problem questions on the forum. In brief, this is asking a question about how to do Y when you really want to do X. You want to do X. You don't know how to do X, but are guessing that maybe doing Y will help. People spend a lot of time helping you with Y, not being sure why you want to do it in the first place. Eventually (sometimes days later) everyone realizes your goal is to do X. Finally you get assistance with the real problem. Solution: State what you really want to do (eg. flash 3 LEDs at different rates) rather than how you think it might be achieved (eg. manipulate internal processor registers). (Right-click and choose "Copy Link Location" to make a copy of one of the links).